fat-free, water-soluble ointment for external use. first degree (minor burns), skin damage, skin tears and abrasions. Exclusively on the physician's prescription is applied Betadine antiseptic ointment for the treatment of infected wounds. or respectively to give a swab. Apply a gauze, gently spread on the wound. If necessary, cover with dressing. As long as the golden brown color of Betadine is visible, the paint acts as a disinfectant ointment. The ointment also at each dressing change. 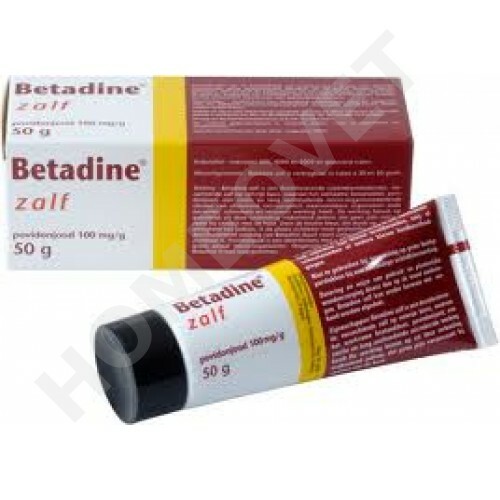 Betadine antiseptic ointment may be applied several times daily. Continue treatment until healed. Drug 10 mg iodine as povidone iodine per 1 g of ointment. Excipients with macrogol ointment base 400 and other excipients.